Whereas a laser is a source of exactly one precise defined frequency, a frequency combs has hundreds of such well defined frequencies with a precise spacing between the individual lines. Commonly such combs are generated through the use of a third order (Kerr) nonlinearity. 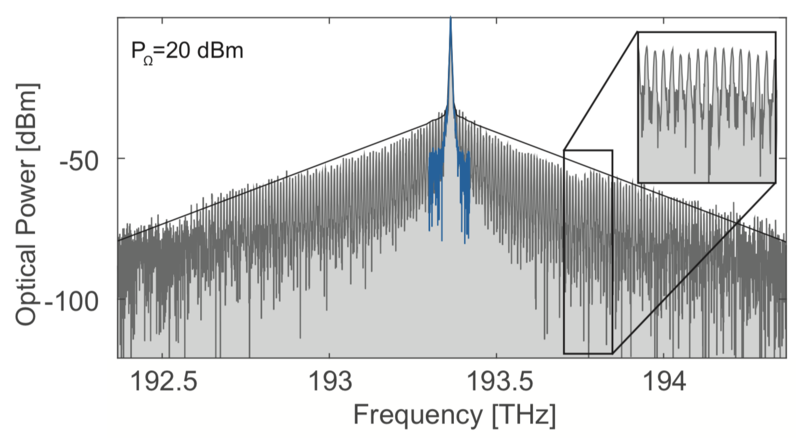 Second oder nonlinearities can be much stronger and we are studying the comb generation in a second order nonlinear crystal, such as Lithium Niobate. The trick is that we send both an optical as well as a microwave signal into the crystal and if everything is perfectly resonant a comb will be formed. We posted this on arXiv (2018). 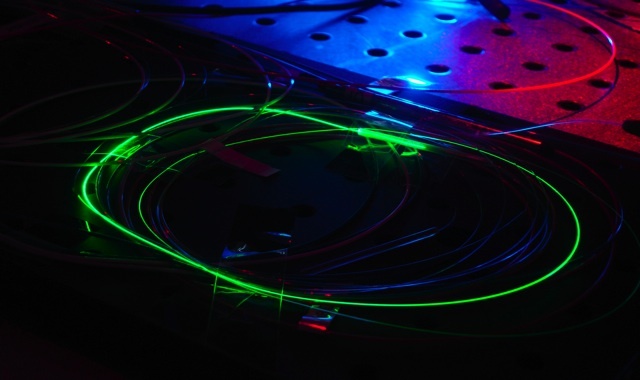 High quality resonators can be used to reduce the linewidth of fibre lasers. We have shown that by just placing a WGM resonator within the loop of a fibre laser, the linewidth can be reduced to sub kHz. Standard fiber ring lasers are cheap, but suffer from unstable lasing behavior and a relative large linewidth. Utilizing a millimeter sized diamond turned CaF2 WGM resonator as a passive filtering element in an erbium-doped fiber ring laser we achieve single mode lasing. This system sustains single mode lasing without the usage of active stabilization techniques which we characterized with a three-cornered-hat measurement to have a linewidth below 13kHz, Optics Letters (2010). These measurements were limited by the reference lasers used. Currently we have build an identical WGM system and together with a commercial system have measures the relative frequency stability to be below a 700Hz and Optics Express (2014).